‘World Visioning Space’ – © Designed by Harman Scott. Image by Fenella Nkhansa and Nicholas Scott 2016. Over many years the concept and design for a sanctuary, a universal place of peace and healing, has been developed by Harman Scott. It is a place where people, of all religions and none, can meet and reconcile, within themselves and with others, in joyful celebration of each others’ humanity. 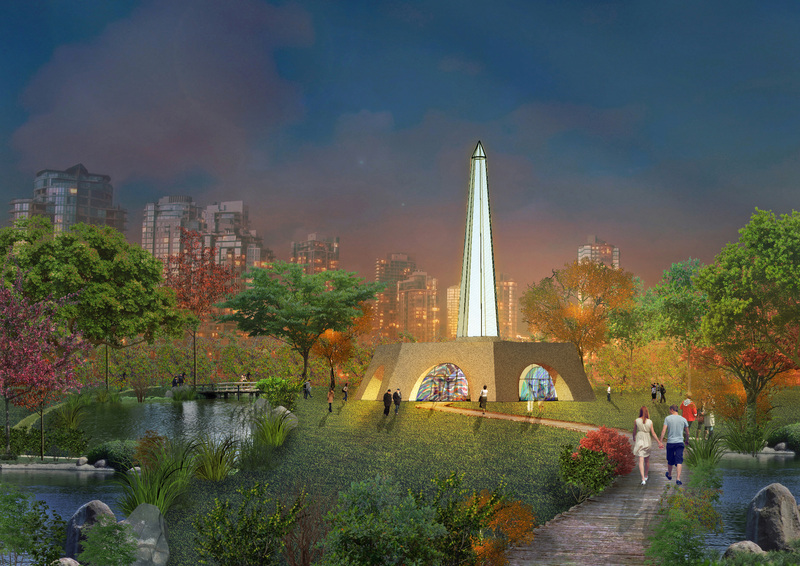 This is being brought into reality in Toronto, Ontario, and is called ‘World Visioning Space’.  A building based on sacred geometry architecture, making visible the desire of humankind for commonality.  An innovative and inspirational private chapel for meditation, an intimate sanctuary, set in healing gardens.  A place where matters of world-wide concern, such as interfaith, human rights, social justice, peace and equality are discussed, and broadcast to the world.  An iconic focus and a beacon for Toronto.  A place to heal and inspire, helped by contemplating seven stained-glass art windows.  For people of all religions and none, to find inner peace, enlightenment, healing, nurture and destiny.  A place to calm down, think and distill thoughts; to open up in a safe place.  A place to experience love for ourselves and for humankind.  All about people and love for mankind, to nurture reverence for the highest aspirations of humanity.  Open every day, free of charge. – The Rev. Dr. John Joseph Mastandrea, Spiritual Director, Metropolitan United church, Toronto, Ontario. – Paul McKenna MA, Interfaith Office, Scarboro Mission, Toronto, Ontario. – David Leslie, Executive Director, Rothko Chapel, Houston, Texas. – Anita Bromberg, Canadian Race Relations Foundation, Toronto, Ontario. – Greg Pennoyer, Program Director, ‘Faith in Canada 150’, Hamilton, Ontario. – Gordon Campbell, Toronto, Ontario. – Mark Maguire, Toronto, Ontario.